One of the greatest clock and watchmakers; to his work is due the supremacy of English horology in the 18c. ; he made some of the first watches with balance-springs. He took Edward BANGER into partnership about 1701, then, apparently, worked alone, and took George GRAHAM into partnership about 1711. On his death, in 1713, Graham continued alone. Geo. Graham from 1713 (No. 4669 plain, 393 rep.). Examples of his watches and clocks in most collections. Several one-year clocks (two in Buckingham Palace), including a spring clock striking hours and quarters. Many watches, long case and bracket clocks illustrated of Cescinsky& Webster (English Domestic Clocks, London 1914). Lantern clock four-month and lantern clocks and watches: Guildhall Museum,and London M.
Six watches: Metropolitan Museum of Art, New York. Gold, engraved watch: Mallett coll. Very early repeating watch No. 63, ca,1690: Ilbert coll. Imprisoned for theft in 1720. Heir to his uncle and prob. retired in 1713.
ca.1701-8. Banger was nephew, apprentice and assistant of Tompion, senior. v. Thomas (1). Long case clock: Weth. coll. Striking and repeating watch movement: Guildall Museum. Pair case watch: Science Museum, S. Kensington. Gold repeating watch: Dennison. coll. ca.1711-13. 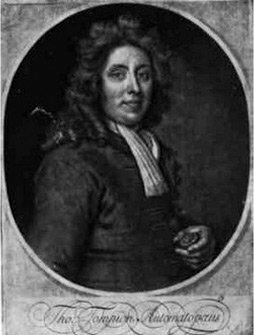 Nephew and, from 1696, pupil of Tompion, senior, and succeeded him in his business. Watches Ilbert and Webster colls.and movement. Guilhall Museum. Long case clock Virginia M. signed 'Thomas Tompion and George Graham.' v. Thomas (1). 1735: juré, (the word juré is used to indicate the officer of the corporation charged with the duty of inspecting work and workshops, in all the corporations, exept that of London. In Paris, the officer was called at different periods 'juré' 'gardevisiteur' and 'syndic'. In London, the equivalent 'warden' or 'Warden of the Clockmakers Company' is used. A celebrated maker, who raised the status of French watchmaking by the perfection of his work and design. Made an equation clock in 1717, described in Gallon, 'Machines et Inventions,' Vol. ttt. Devised the horizontal arrangement of parts in turret clocks, and gained a great reputation for his turret clocks. Devised a compensation pendulum in 1738 and an escapement for pendulum clocks. First made thin repeating watches by omitting the bell and allowing the hammers to strike on the case. About 1725 introduced the French form of potence with screw adjustment. Wrote several memoirs on horology. Fine Boulle clock: Palais de Fontainebleau. Silver travelling clock and cartel clock: National Museum, Stockholm. 3. LEPAUTE - Jean André, Paris. In 1753 devised a pin-wheel escapement for clocks, with pins on both sides of the wheel, which has been widely used. Also a clock in which the pendulum made 60 swings for the escape of one tooth. Published 'Traitéd'Horlogerie', Paris, 1755, 1760 and 1767. Made several public clocks in Paris; one on the École Royale Militaire still working. Clock S.K.M. with case of Vincennes porcelain. Year long case clock: Buckingham Palace. Three clocks: Palais de Fontainebleau. Fine vase clock: Petit Palais. In partnership with Jean André, and when he retired in 1774 took into partnership his nephews Pierre HENRY and Pierre Basile LEPAUTE.